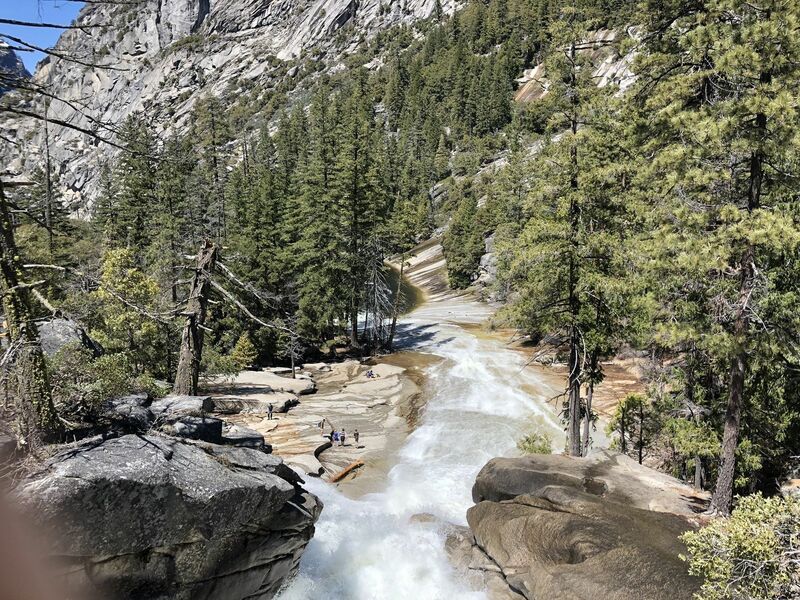 Vernal and Nevada Falls via the Mist Trail is a 6.4 mile heavily trafficked loop trail located near Yosemite Valley, California that features a waterfall and is rated as difficult. The trail is primarily used for hiking, walking, nature trips, and bird watching and is best used from April until October. 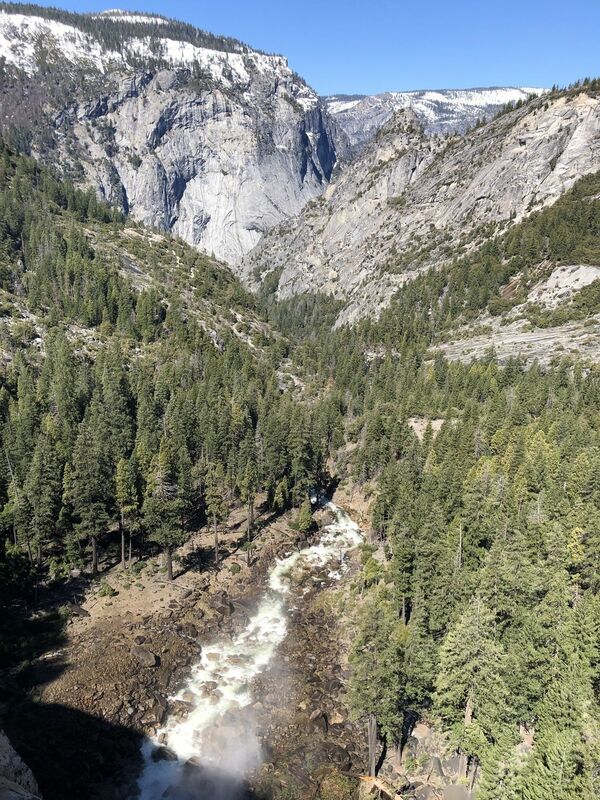 During the winter months, portions of the John Muir Trail in Yosemite are closed. 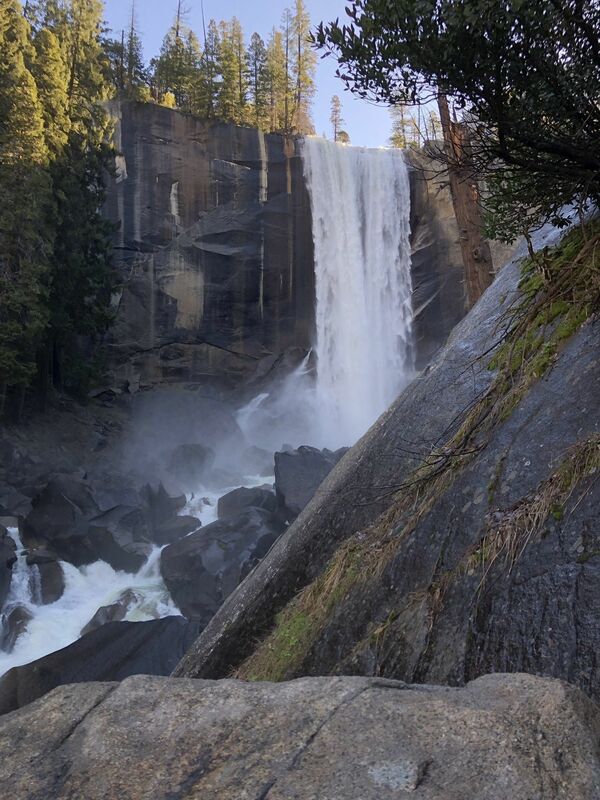 Visitors can still visit the falls, but you must return on the stairs, instead of returning on the John Muir Trail. 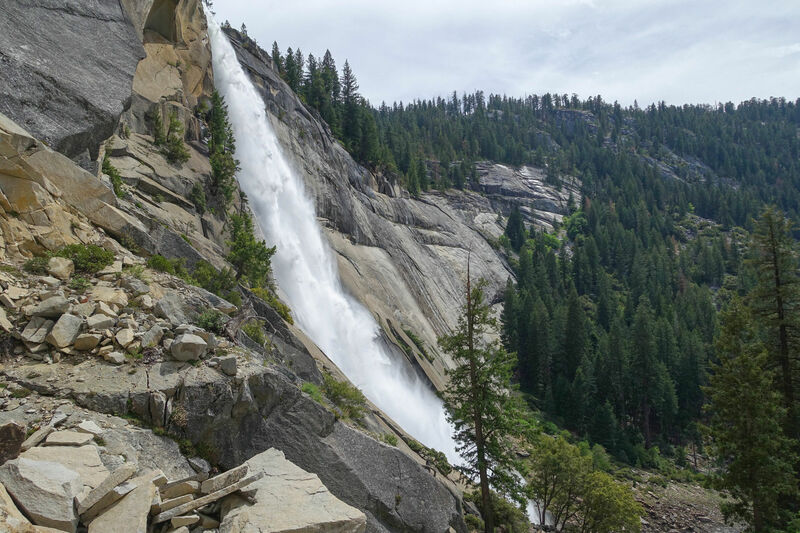 Hike to two breath-taking waterfalls along Yosemite Valley's most popular hiking trails. 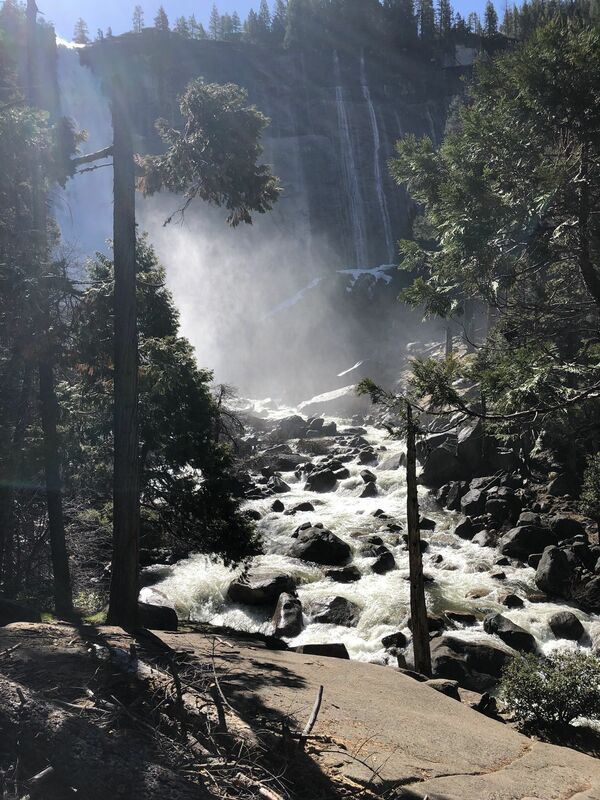 If you only have time for one hike while in Yosemite look no further: the Mist Trail is the hike for you. 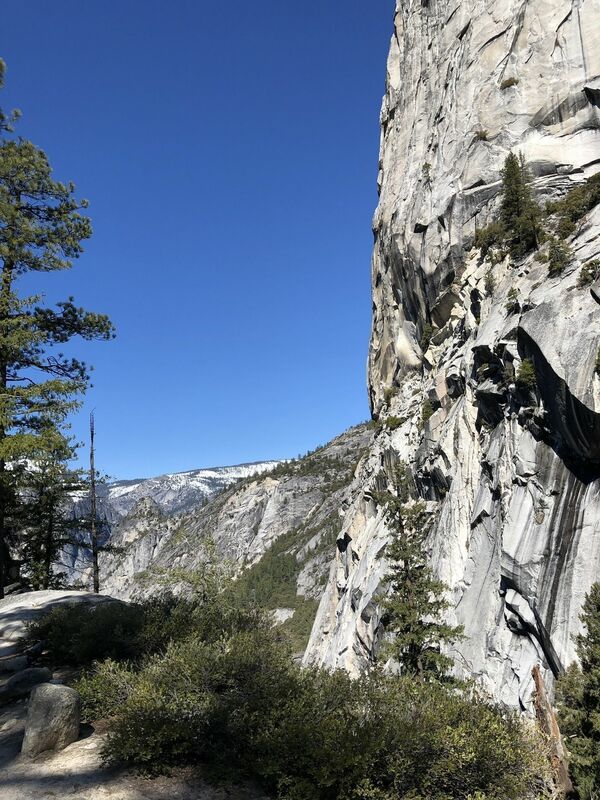 It is no wonder why this trail is one of the most popular trails in Yosemite Valley. You will hike so close to 2 massive waterfalls that it will be very difficult to avoid the mist from the falls. 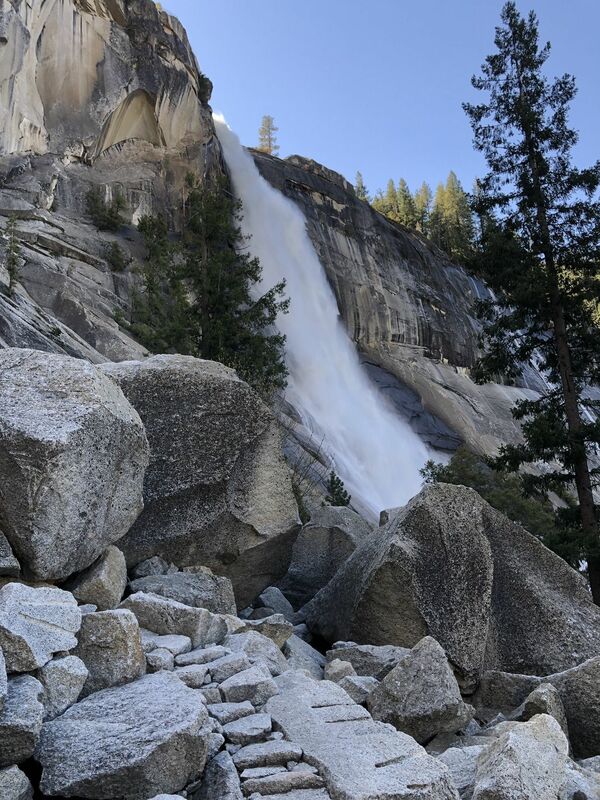 The best time to hike this trail is in Spring or early Summer, while the snow runoff is high and the falls are full of water. 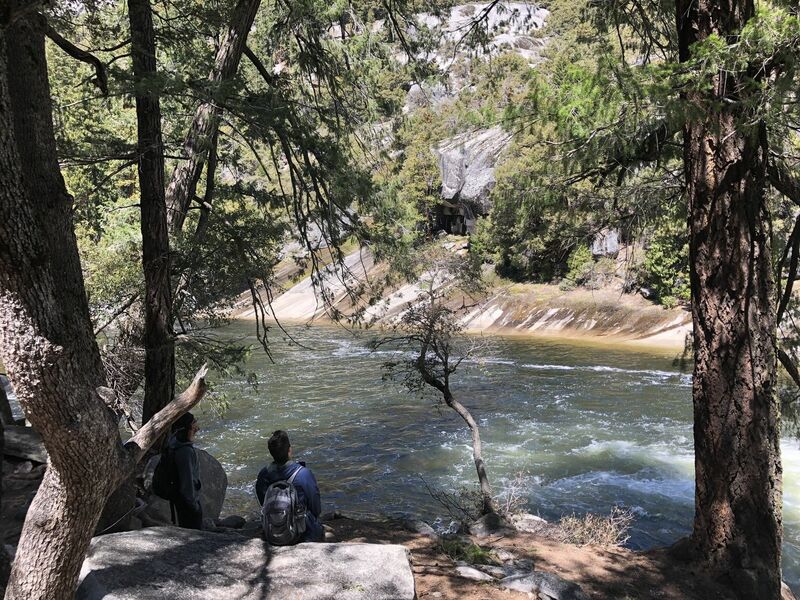 The Mist Trail starts at Happy Isles trailhead (YARTS shuttle stop #16, and within walking distance of Curry Village and parking lot). 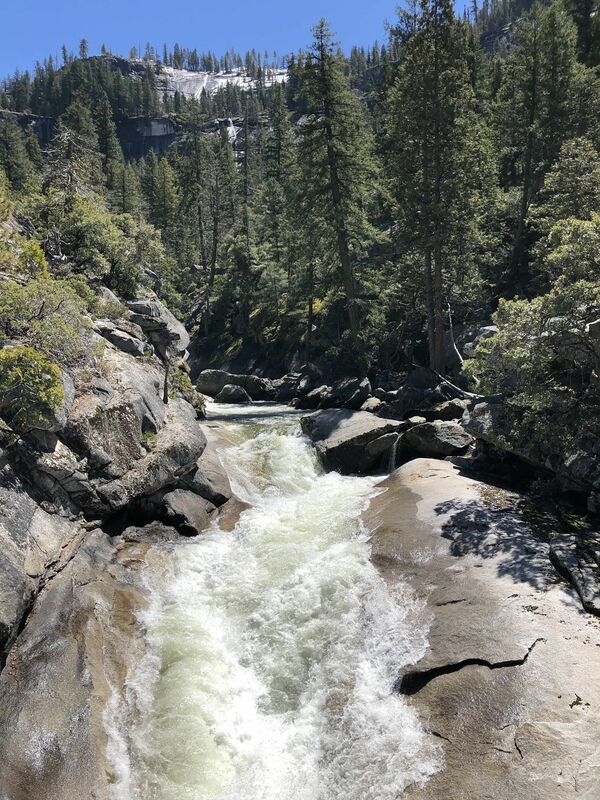 After a brief stroll along the river, you climb a pretty steep initial accent until you reach the footbridge, which offers the first glimpse of Vernal Fall in the distance (and a water-fountain and restrooms). 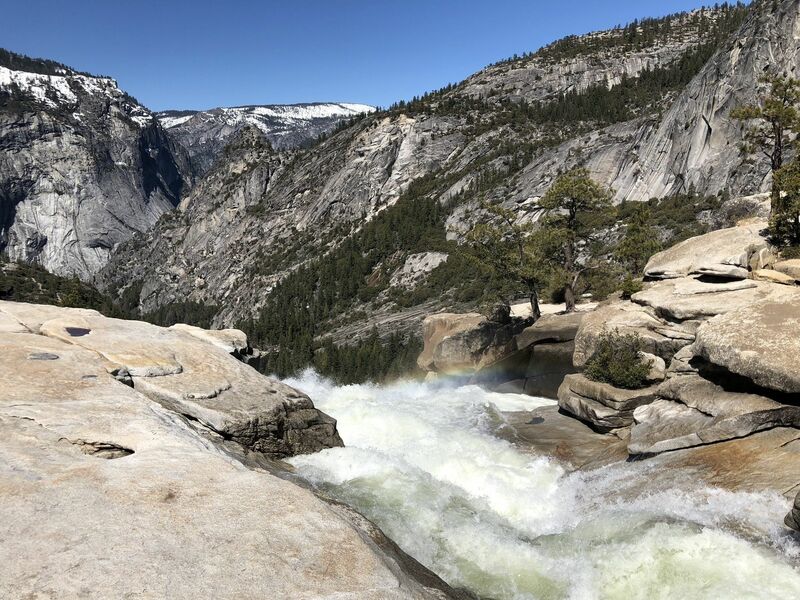 You will then continue up to Vernal Fall, past Emerald Pool, and alongside Nevada Fall until you reach the high-point for this hike. 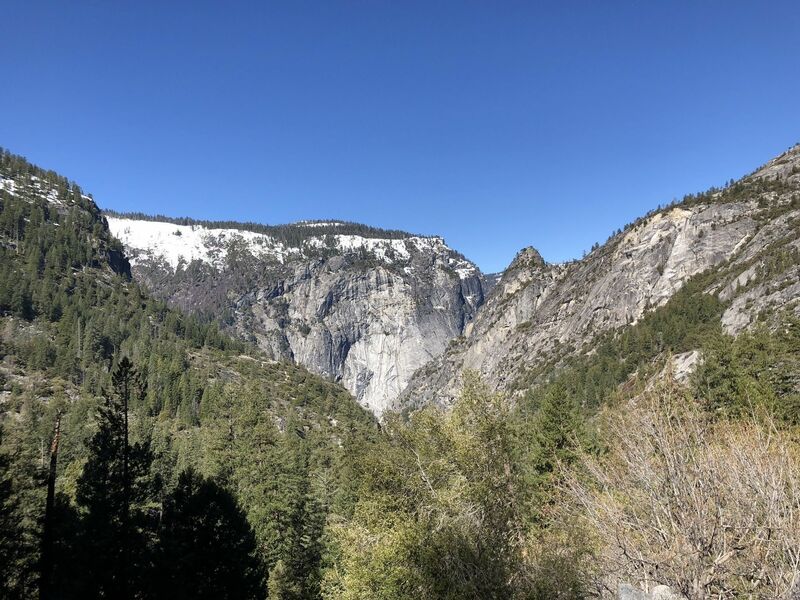 Then take the alternate route down along the John Muir Trail to see views of Nevada Fall and Liberty Cap in the distance before meeting back up with the Mist Trail near the footbridge. The route back is slightly longer, but offers a change of scenery and is easier on the knees. Before hopping back on the YARTS shuttle, treat yourself to some ice cream or a refreshing drink at the small stand, or head over to Curry Village for a larger variety of choices. 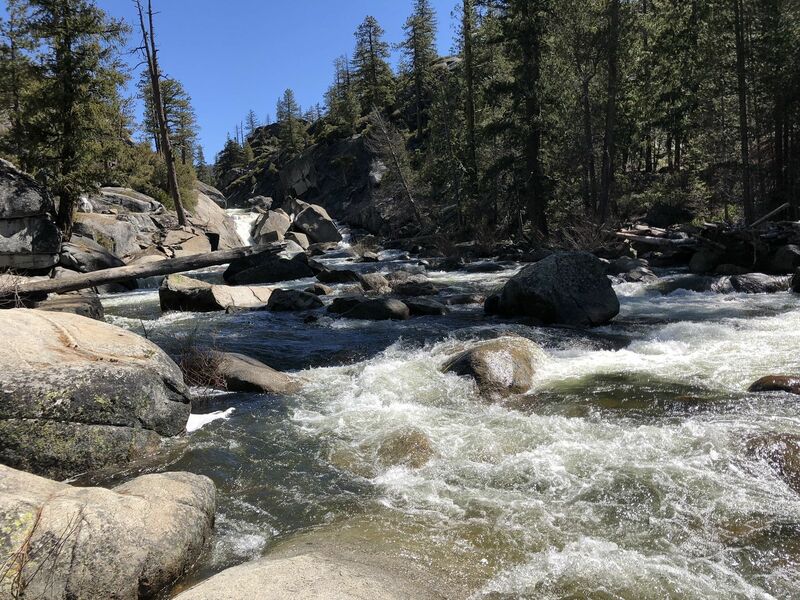 Start your hike at Happy Isles Trailhead (YARTS stop #16), and walk along the Merced River for a while before hiking a fairly steep section leading up to the footbridge. On your right, you may be able to see some water from Illilouete Fall if it is still early in the season. 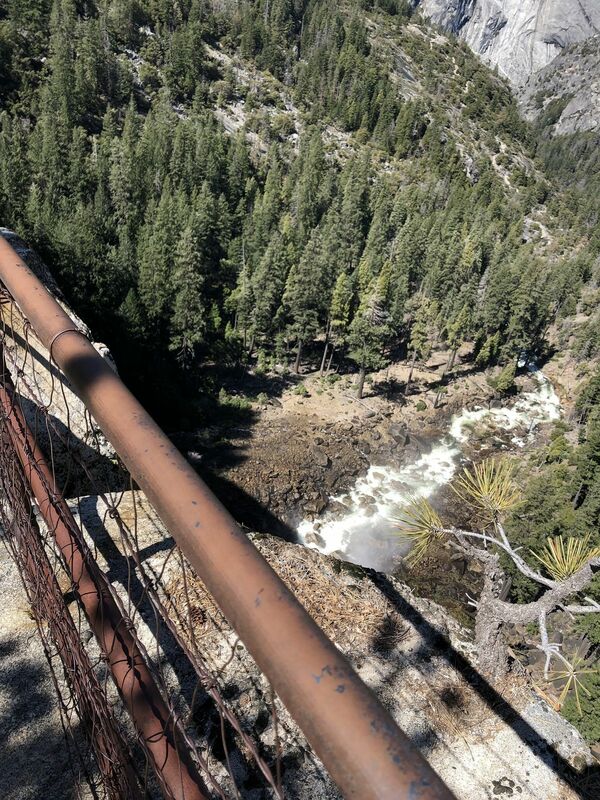 After about 0.8 miles you will arrive at the footbridge where you will get your first glimpse of Vernal Fall in the distance. 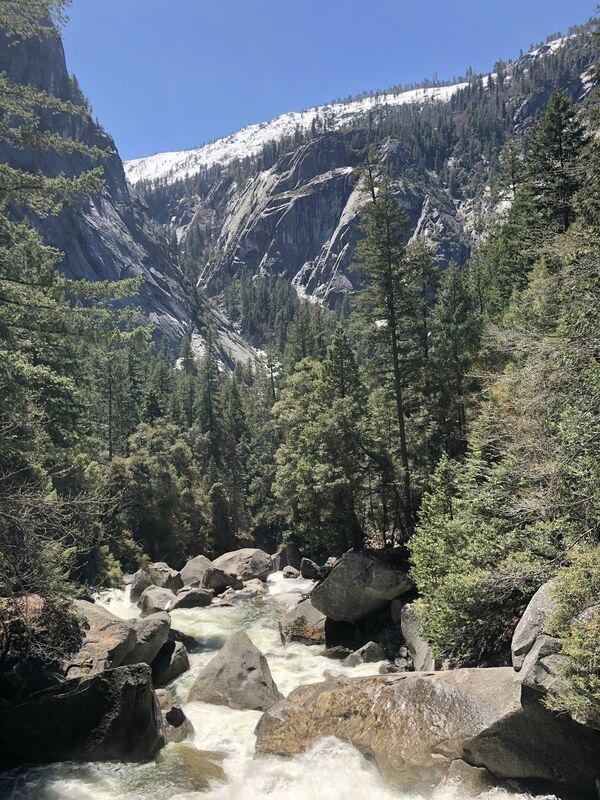 After about a 0.8 miles you will walk across the Merced River on a wooden bridge, with views of Vernal Fall in the distance. There is a restroom and water fountains here, and it's a good place to take quick rest as it gets quite steep after this point. 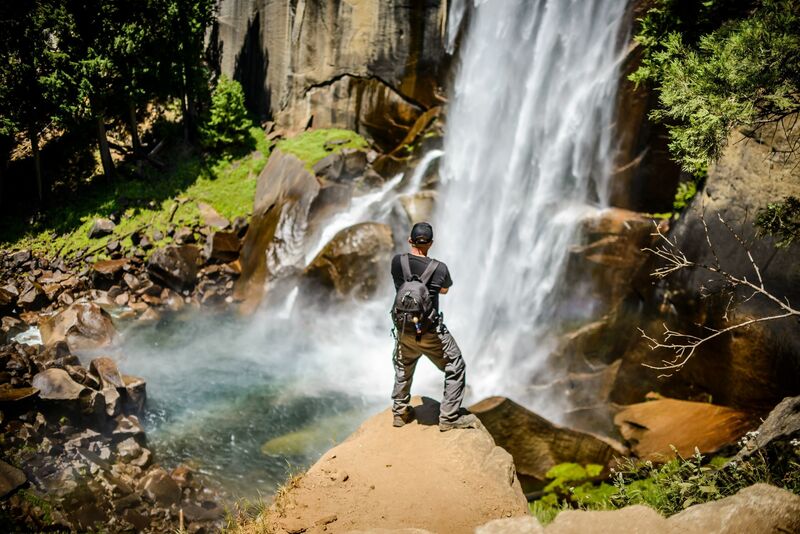 After hiking about 1.5 miles from the start you will arrive at the magnificent Vernal Fall. 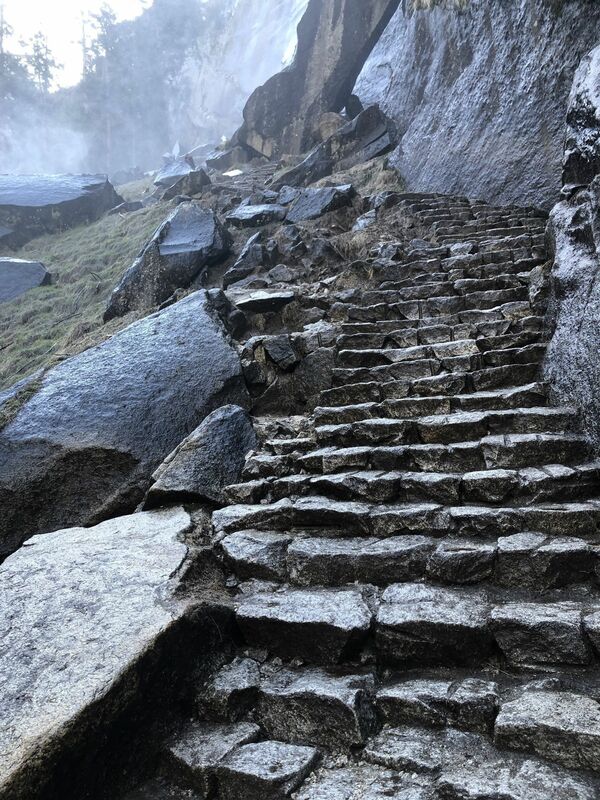 You likely will have learned why the trail is called "The Mist Trail" on your way up. 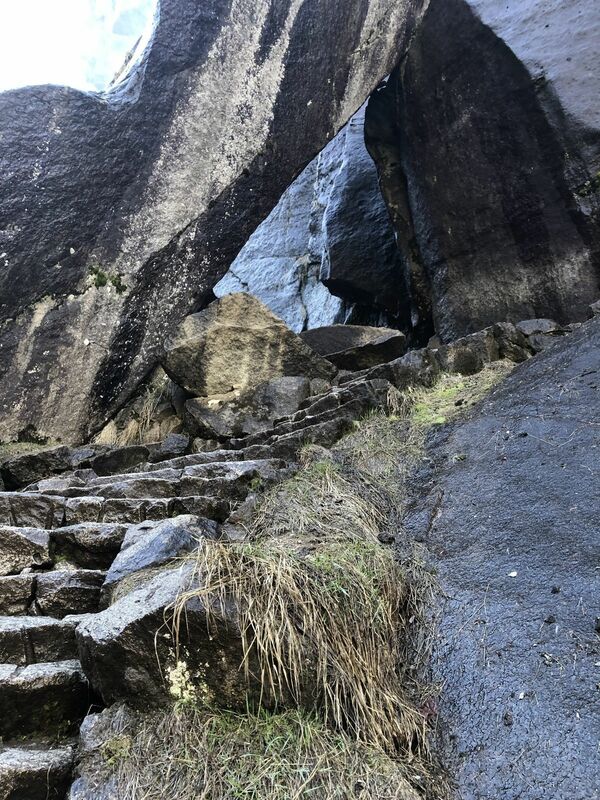 The rock stairs can be a bit slippery when wet, so be careful. From the top you can take a water break and creep to the edge (don't worry, there are rails) to look straight down at the river below. 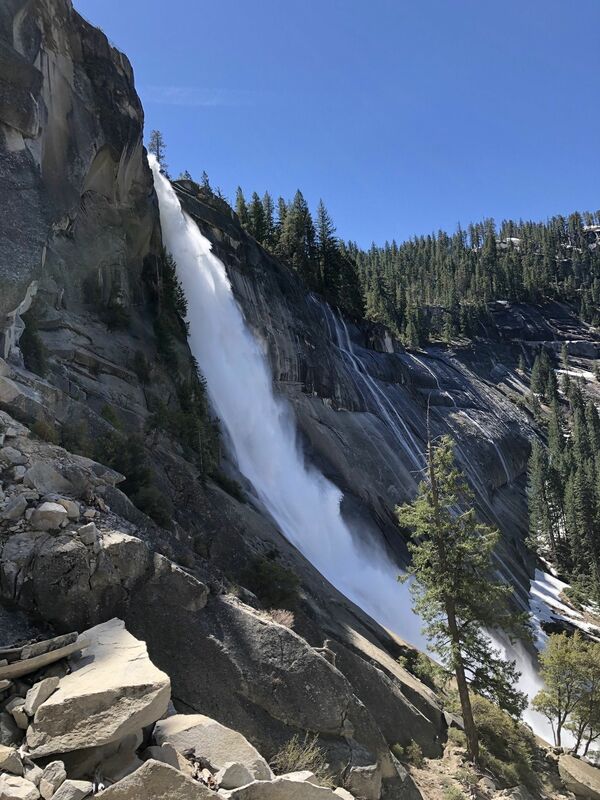 To see Vernal Fall at its fullest, visit around May or June when the snow is mostly melted and the upper lakes are at their fullest. 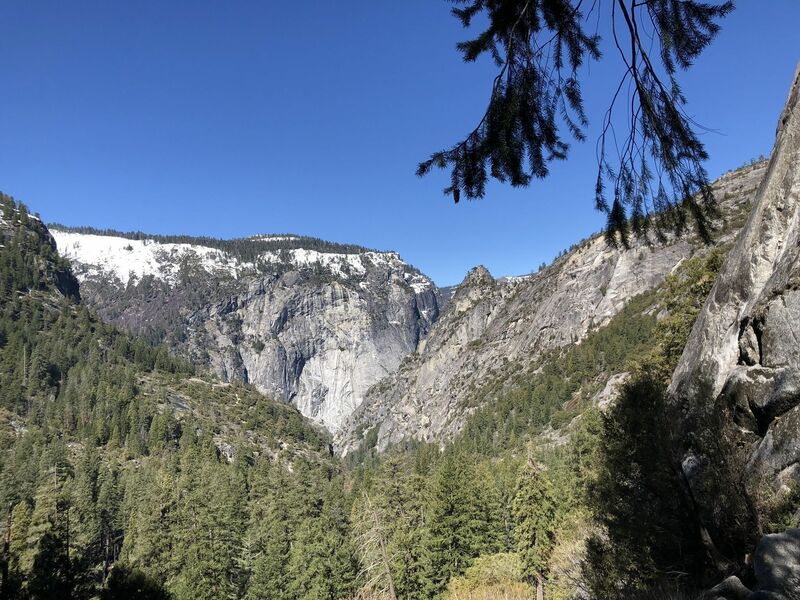 If you do not plan to hike onwards to Nevada Fall, make sure to continue a little ways further to admire Emerald Pool, only a little ways away. 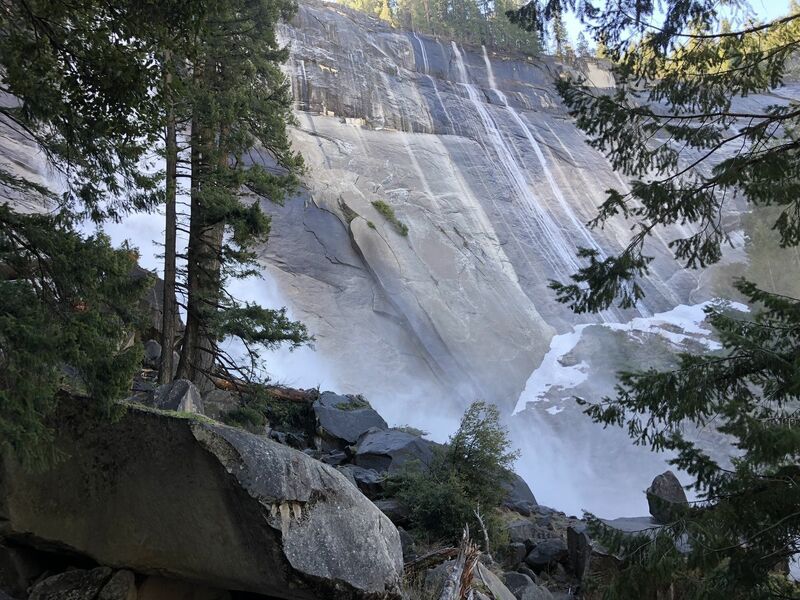 Emerald Pool sits at the top of Vernal Fall, and at the end of the Silver Apron, a granite "slide" leading coming from Nevada Falls. 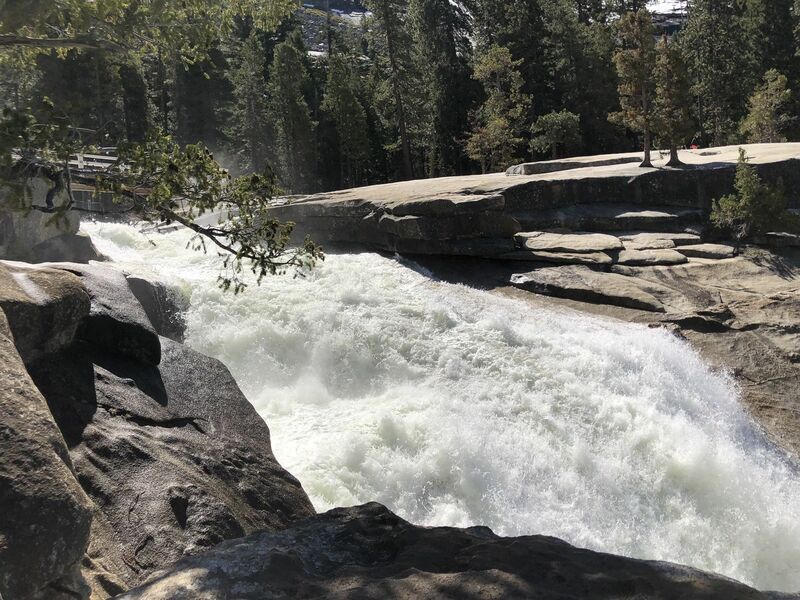 While it may look fun to slide down, restrain yourself, and the current underwater is much stronger than it looks, and swimmers have been swept off the edge of the Fall. But that doesn't mean you can't sit by the water, soak your feet, and enjoy your lunch! 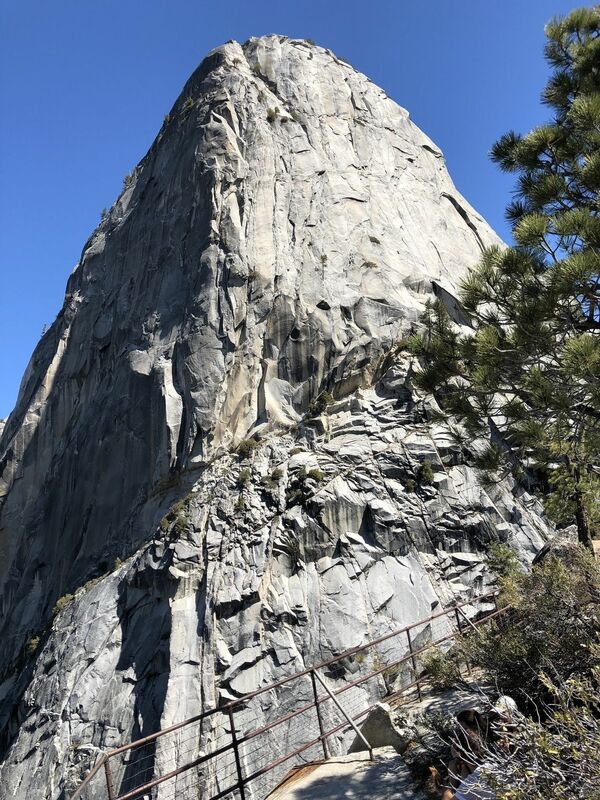 Another 2 miles after Vernal Fall (and up some pretty steep, rock switchbacks) you will make it to the top of Nevada Fall. The best spot for photographs is about half way up the waterfall, and should be fairly obvious. 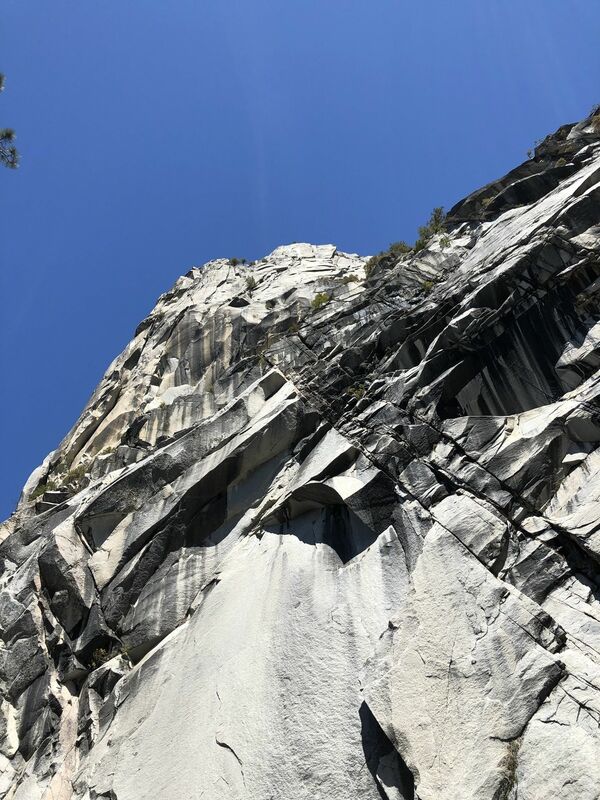 Once you reach the fork at the top of the climb, turn right for a short trip to the top of Nevada Fall. 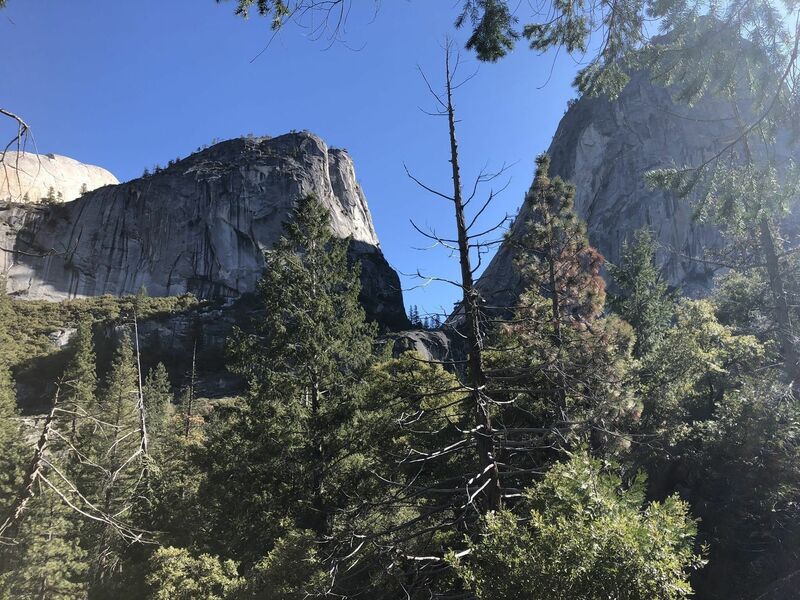 If you are continuing on to Half Dome, hike back to the fork and continue straight ahead and you will soon enter Little Yosemite Valley. 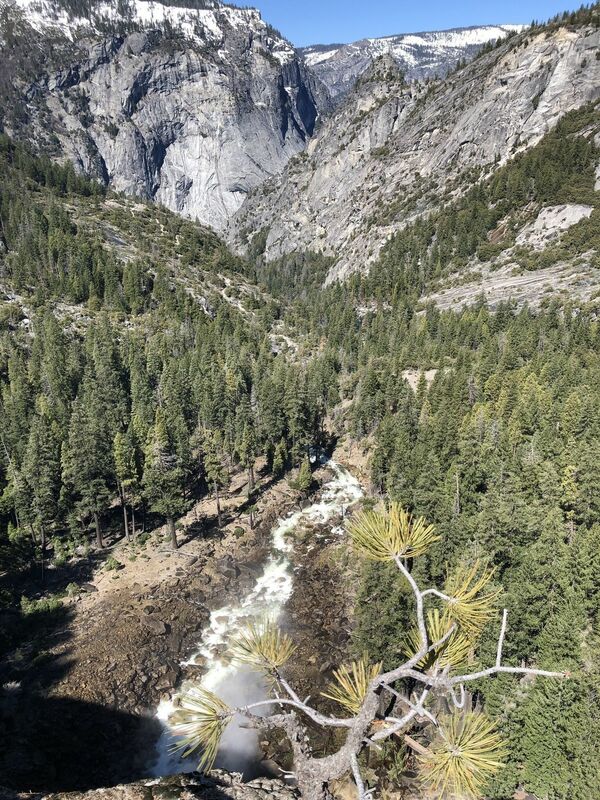 If you are hiking the Mist Trail, continue back down along the John Muir Trail towards the footbridge. 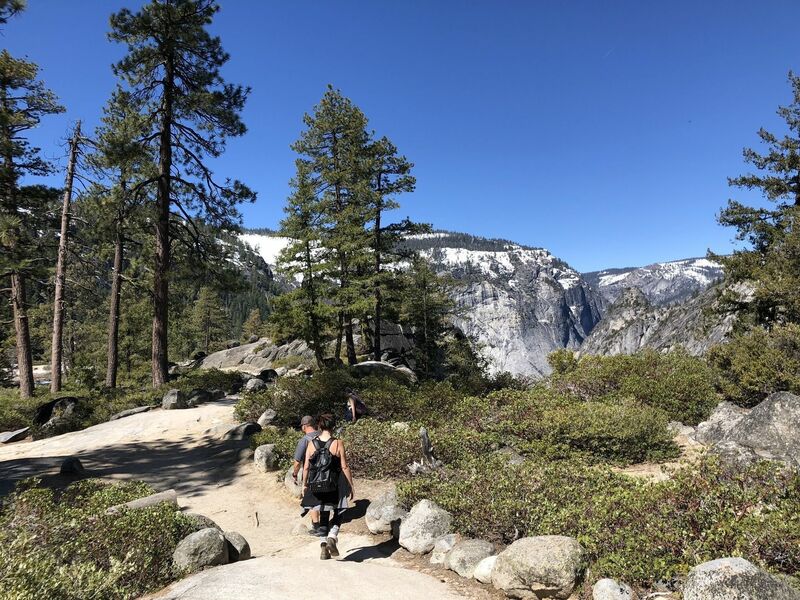 Many hikers prefer to take the John Muir Trail on the way back because it offers fresh scenery, further views of Liberty Cap and Nevada Fall, and mostly because it is not nearly as steep as the Mist Trail, and much easier on the knees (although it is slightly longer). 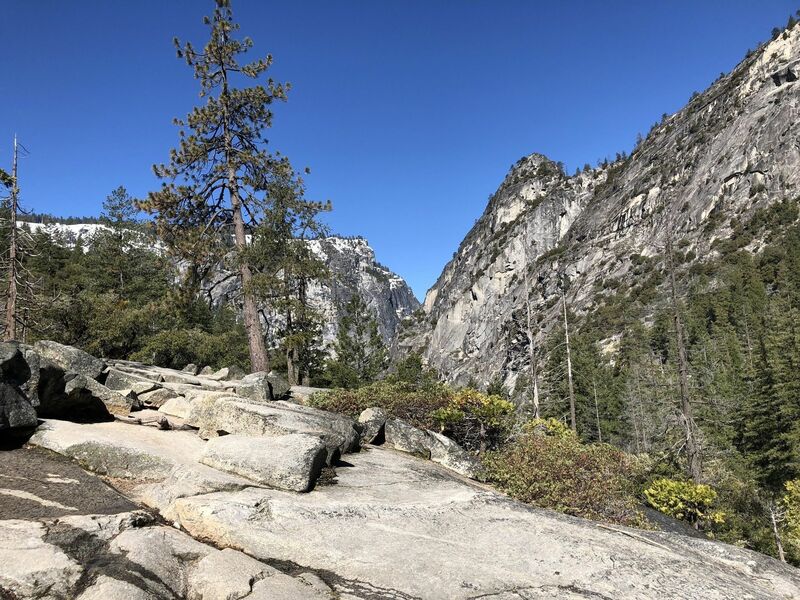 It is 2.5 miles back to Happy Isles back along the Mist Trail, or about 4 via the John Muir Trail. Either way you will pass the footbridge again, where you can refill your water bottles. 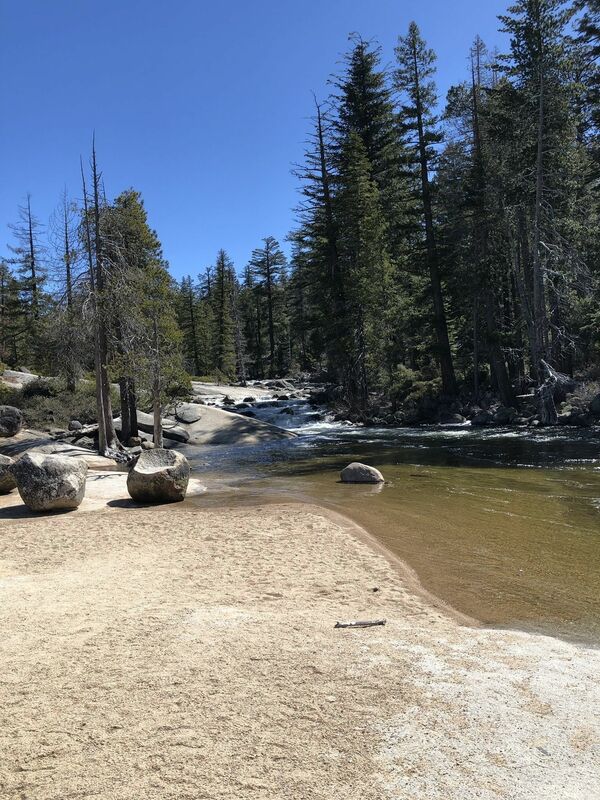 There is a water fountain at the footbridge, but you will need to bring at least 1L of water to hold you until you get back near the end of the hike. 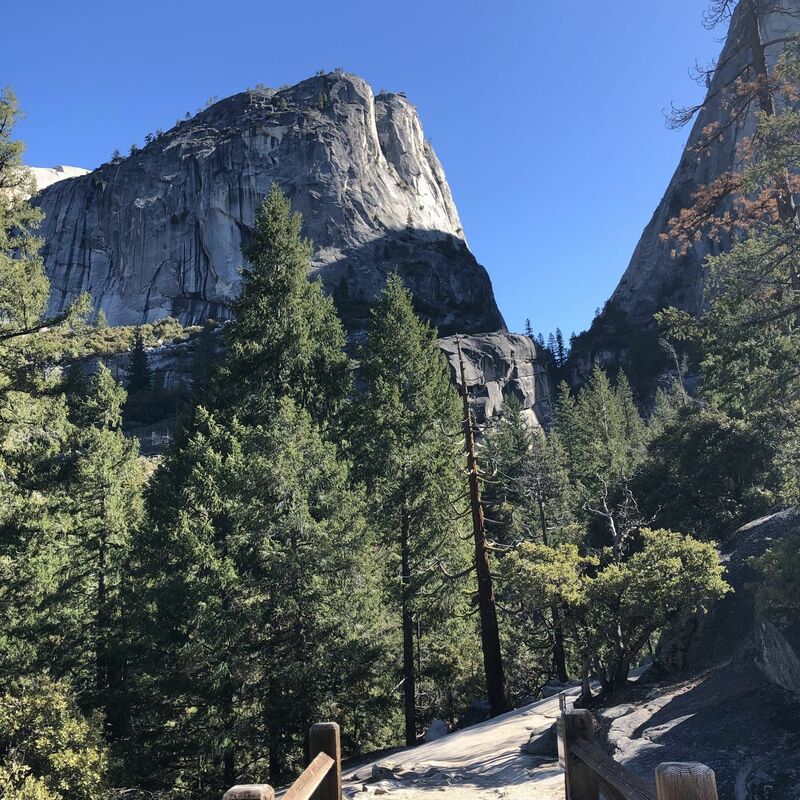 If you visit the park in the off season you can normally park at the Happy Isles trailhead parking area and hike to the trailhead. During peak season park anywhere you can that is near the shuttle route, then take the shuttle to stop #16. Extremely beautiful trail. JMT is covered with snow, be prepared. 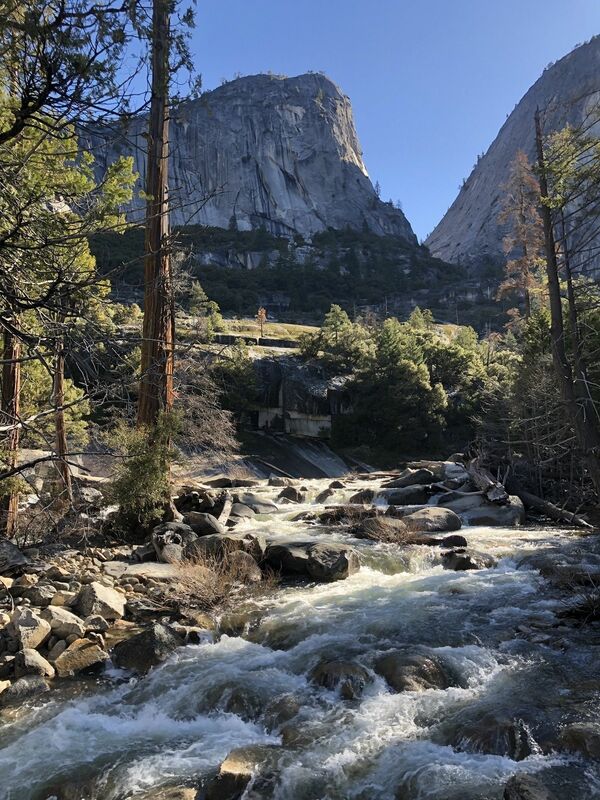 Did this yesterday and i could only say big “WOW” the reviews previously are so true if you only got 1 day to visit yosemite and your up to a big challenge do this and you will never forget and you will say i’ll do this again and again.... toughest trail i did so far but the most rewarding.. since this is a very popular trail do it early i would say before 8am and enjoy.. on our way back did John muir trail there’s a steel gate that says the trail is “ close “ because of danger in rock falling but we saw a couple with an 8 year old daughter just coming through and said it was doable so we went and truly enough it’s “ doable” parts of the trail was covered with snow trees fallen and by the look of it still in the process of clearing the trails, good thing i’m always ready had my sticks and spikes with me I have just started hiking last year and still conquering my fear of heights and ridges yesterday was a scary challenging experience i was fearful i would slide into the cliff but thank God we made it through... and i would say i’ll do it again . I did this in September 2017 and I wasn't an avid hiker. It was strenuous (600+ stairs!!! ), but so worth it! 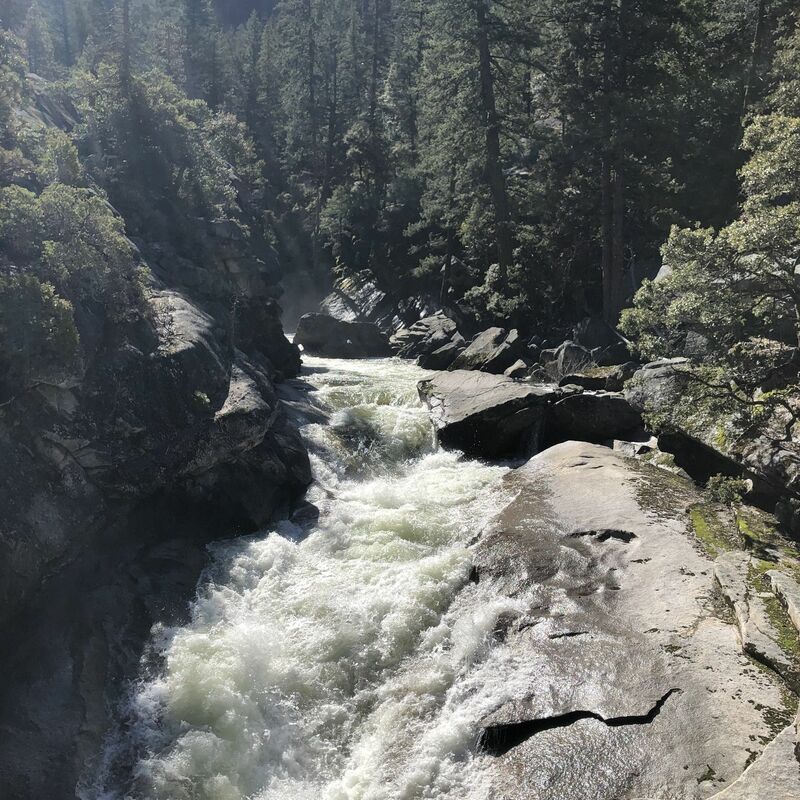 We hiked on to Nevada Falls and it was breathtaking. I suggest giving yourself extra time if you're not the best hiker, the 2,000+ elevation gain is no joke! Its also heavily trafficked until you get to the top of Vernal, then it breaks up quite a bit. The top is very difficult when covered in snow but the view is beautiful. Done this a few times now with my family. First time we did it my daughter was almost 3 and she crushed it. One of the best around. Love it! I’ve done this trail 4 times,I’ll do it again. Mist trail going up,John Muir down is the safest way but I usually do the opposite,since the John Muir is more strenuous. 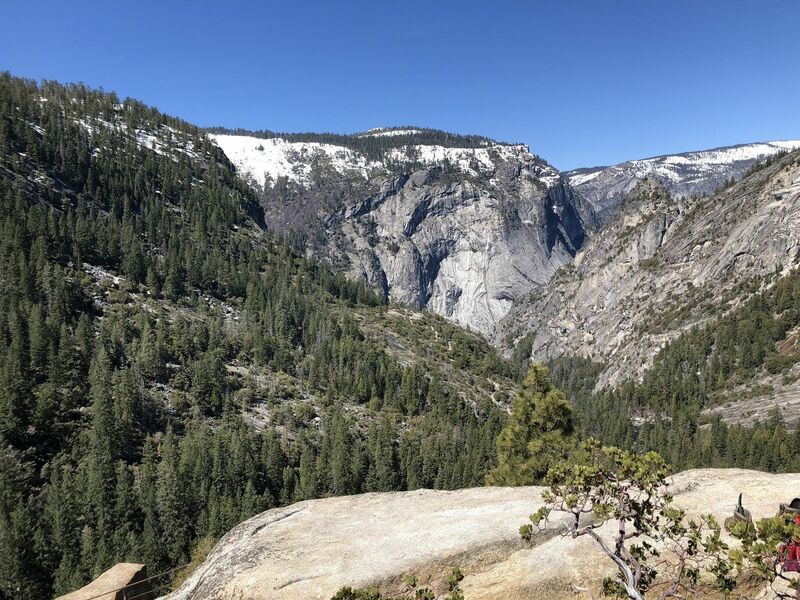 If you visit Yosemite and did not do this moderate hike, you wasted your time and money. 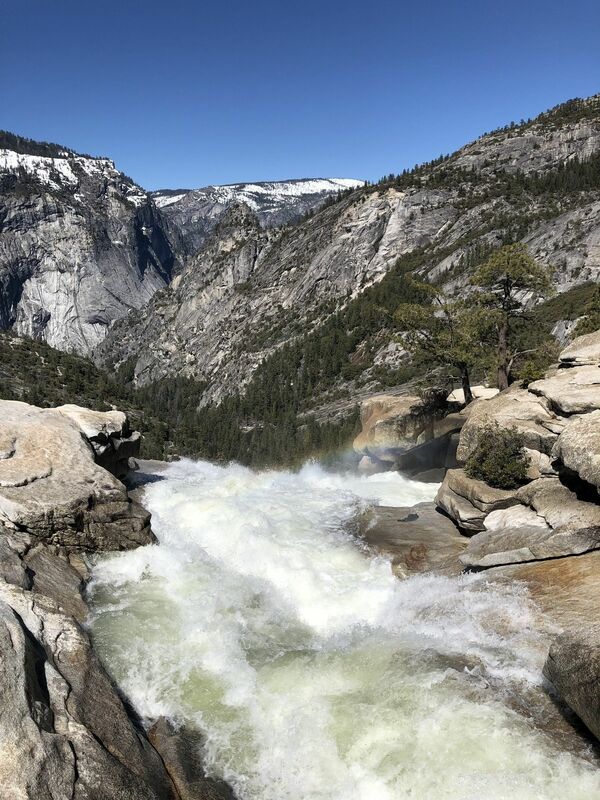 The best view of the most gorgeous water fall can be seen and felt via Mist Trail. 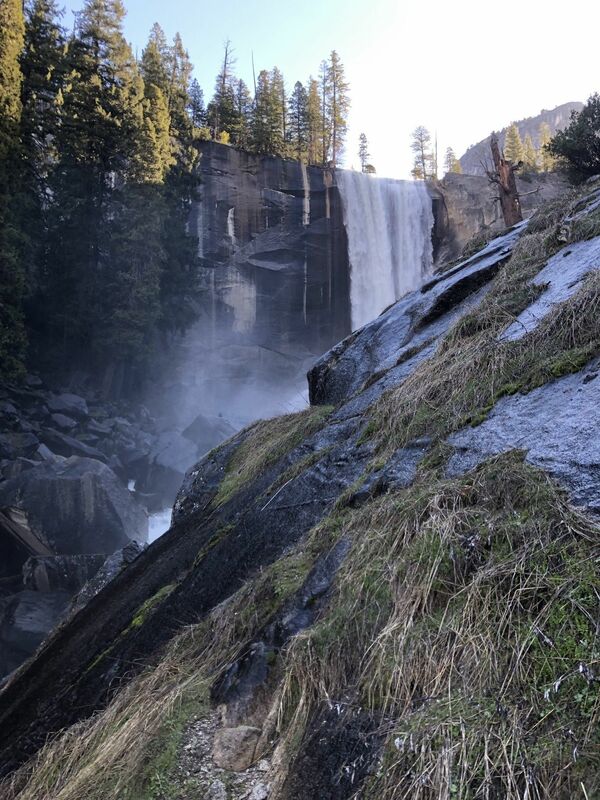 Vernal Fall is huge and since the trail runs right next to it, you’ll have front row seats to the beauty of Yosemite. Very crowded though. 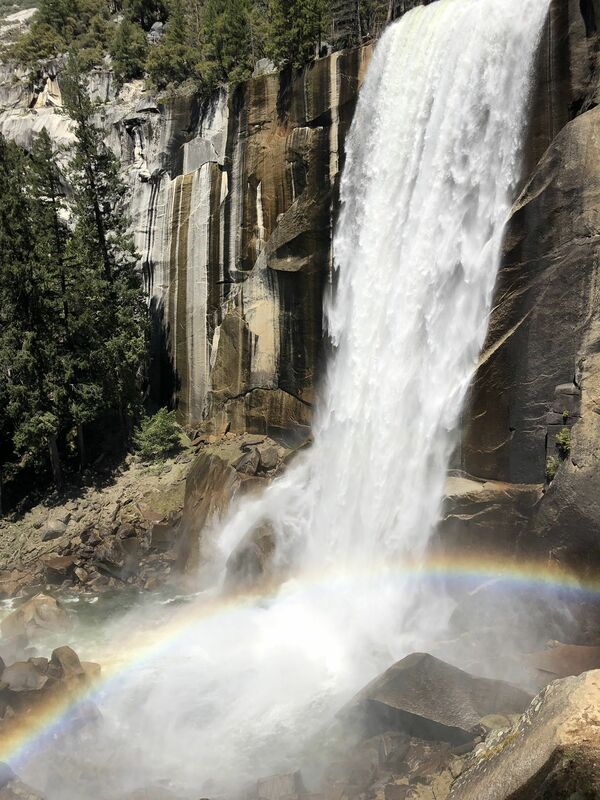 Once you get to the top of Vernal Fall, continue on to Nevada Fall. 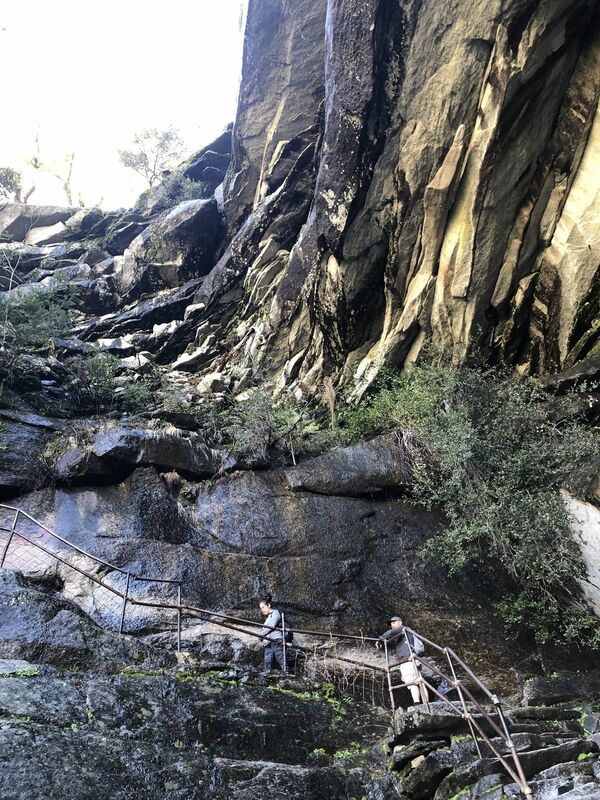 Most people turn back after getting to the top at Vernal Fall. Though most have decided to turn back, there’s still quite a few that will venture forward to Nevada Fall. 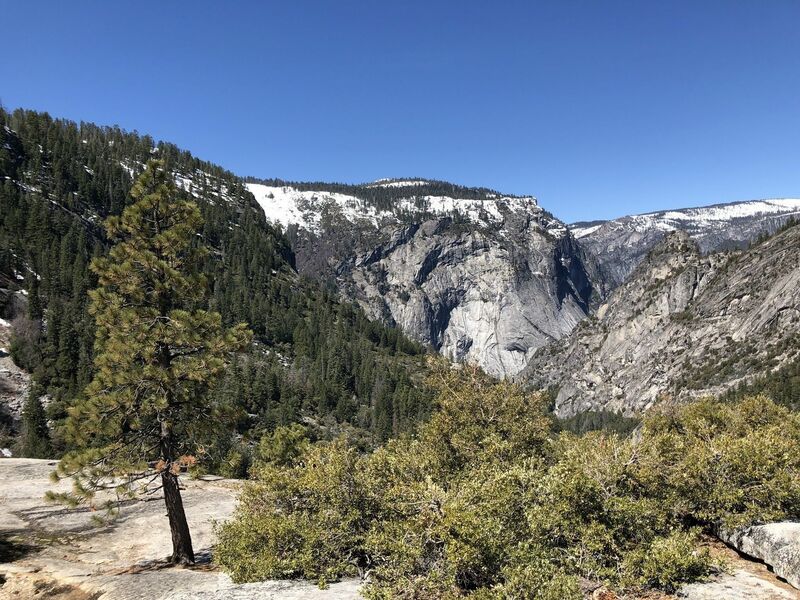 Once you get to Nevada Fall, there will be a restroom there. Though not hard, the elevation gain and length is enough to encourage you to take several breathers. Bring plenty of water (a liter per person minimum). I’ve done this hike about four times and enjoyed it each time. 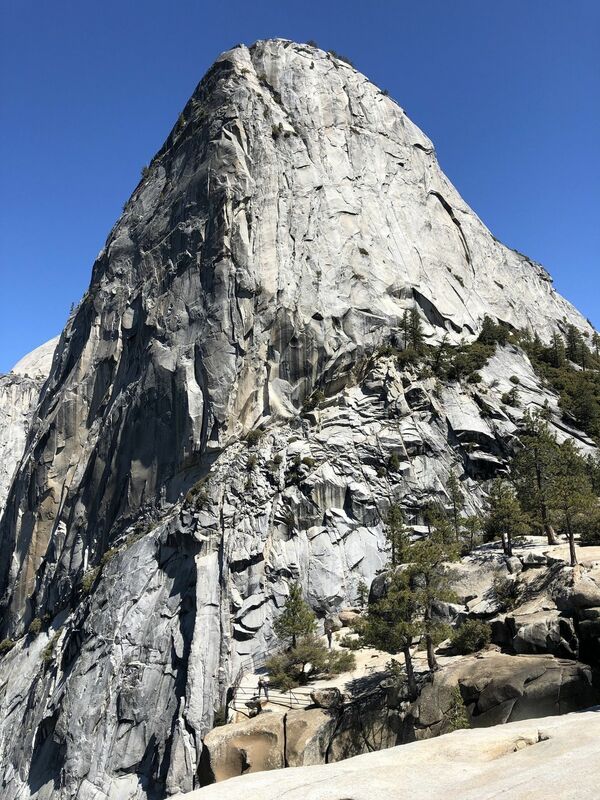 Would do more if not for the steep entrance fee into Yosemite that keeps going up. It usually takes me about 6 hours to complete the hike. It is kid friendly and though hiking gear is recommended, I have done just fine with running shoes. 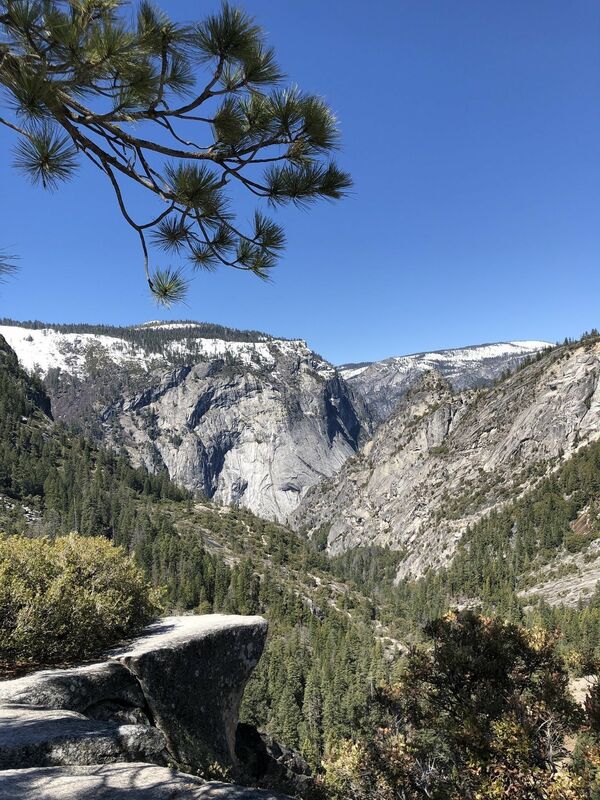 Nothing compares to hiking in Yosemite! 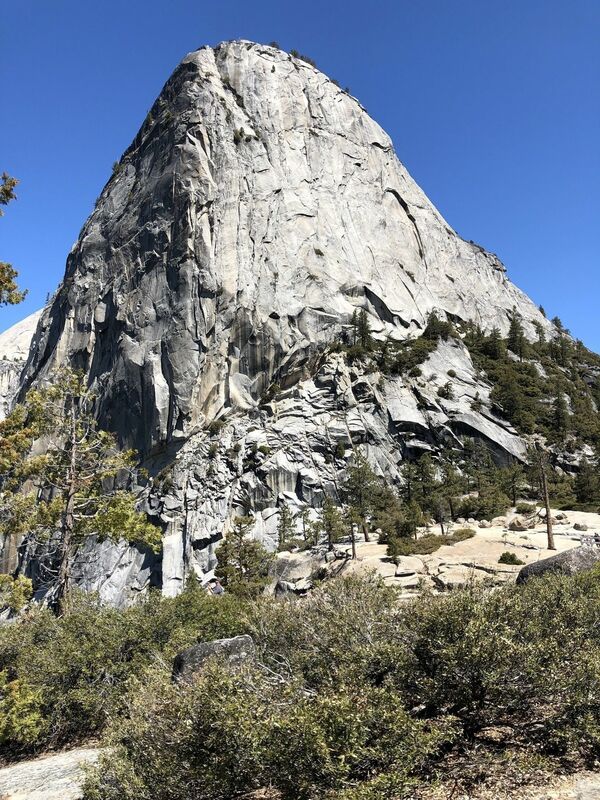 Did this hike 03/09 on a sunny day. The closed trail in the winter makes it a lot longer than what the signs advertise at the beginning of the hike - plan lots of time to do it. We started at 8am and finished at 2pm with lots of breaks and losing the trail a couple times. 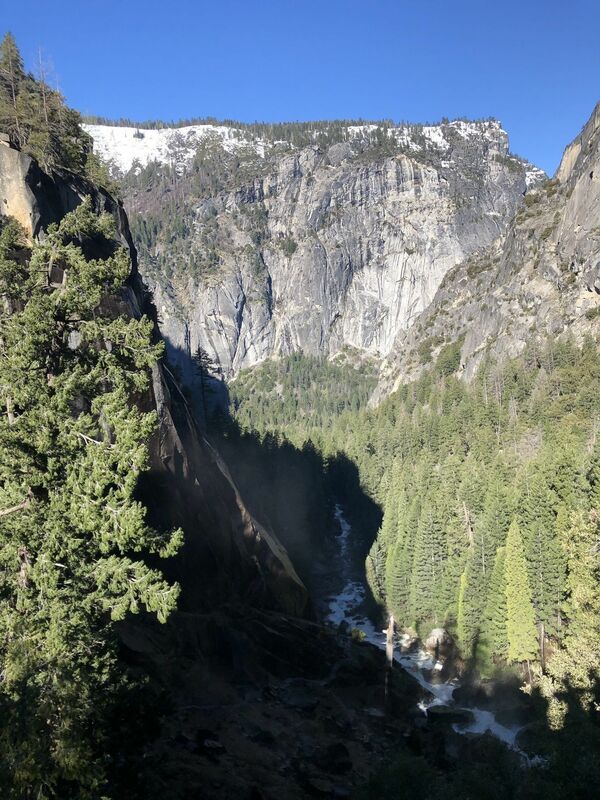 With the trail closure you can only get to the viewpoint at the top of Vernal fall, and the hike up is very steep and snow covered currently. Spikes are highly reccomended. 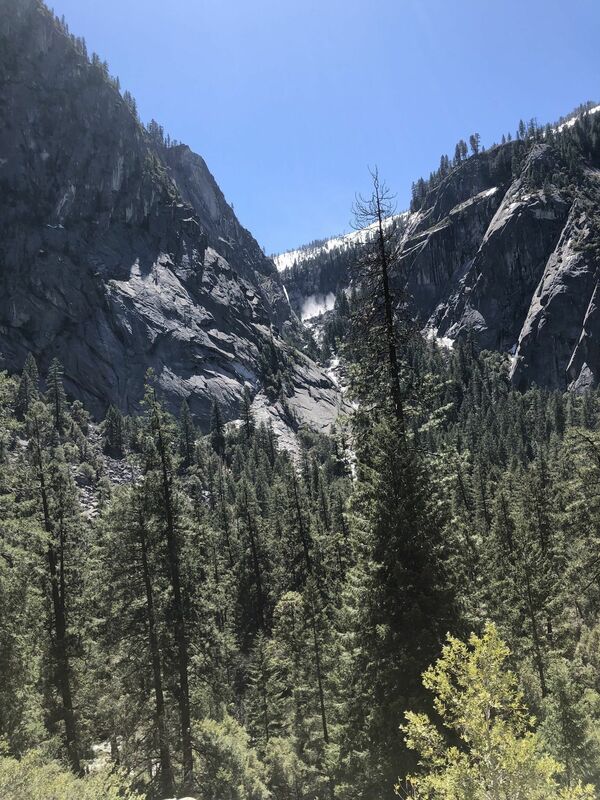 The last section of the trail leading to Nevada falls was not marked and snowed over so we had to somewhat guess the way. 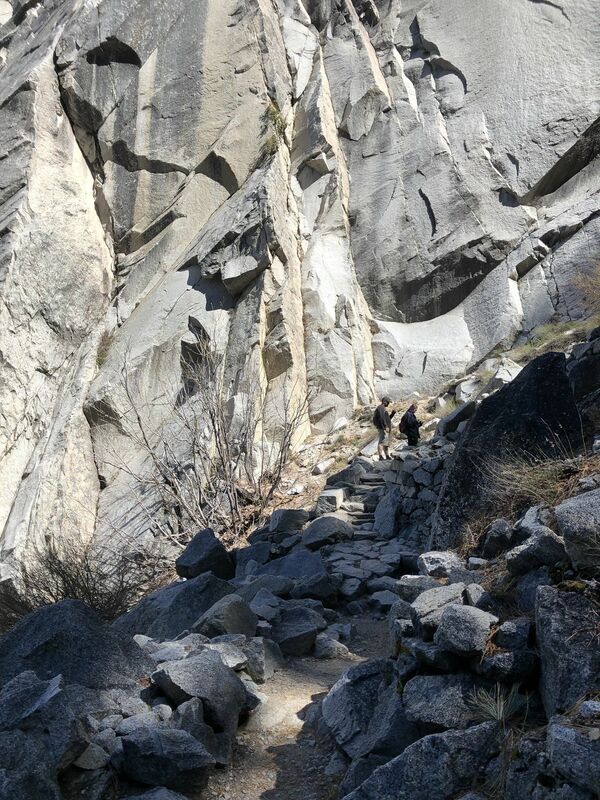 Very beautiful hike but not for the faint of heart in the winter. Give yourself lots of time, dress warmly, and plan to do more sliding than walking on the way back down. Great hike. Those waterfalls... love the sounds and views, Crowded. 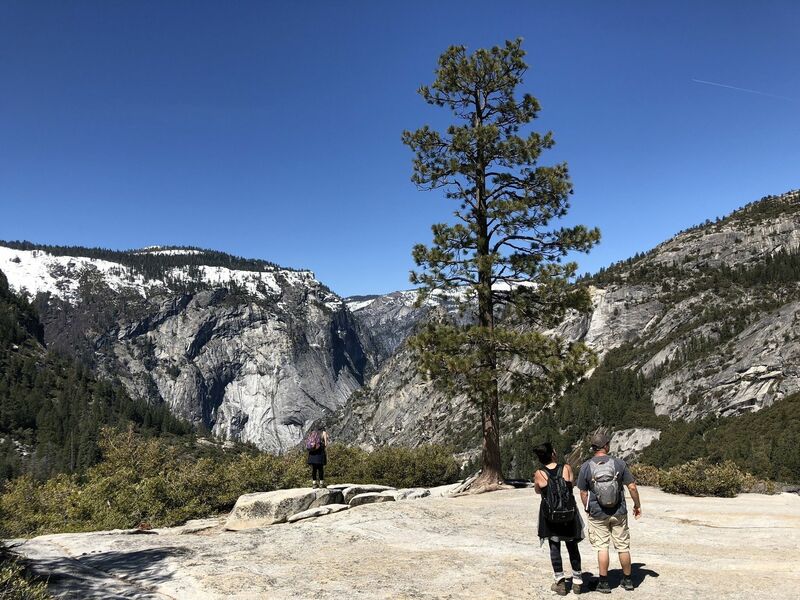 If doing this hike consider making this hike into the Yosemite Grand Tour, you've already completed the most challenging part and there are not crazy crowds and you'll get to see glacier point among other views. This is nice but heavily travelled with A LOT of people. 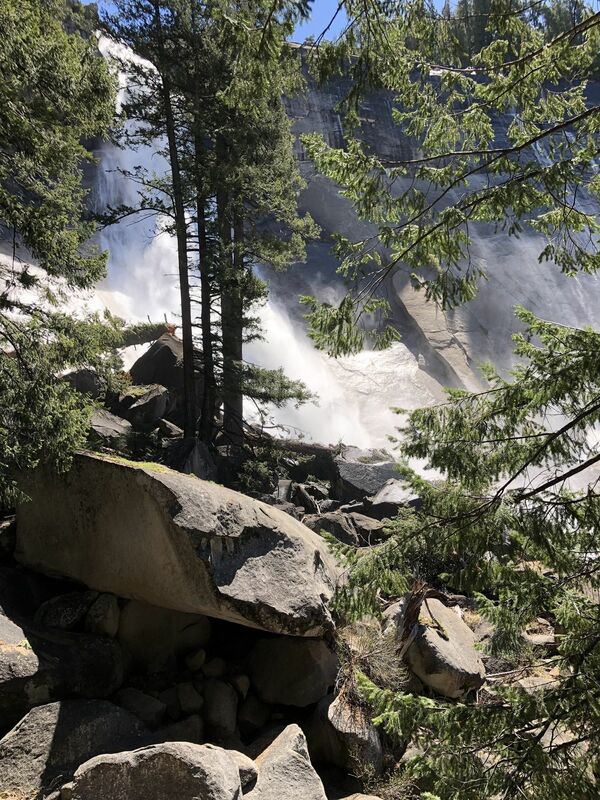 If you can get to the 'Horse Trail' aka John Muir Trail, you can avoid the long lines going up the Mist Trail. 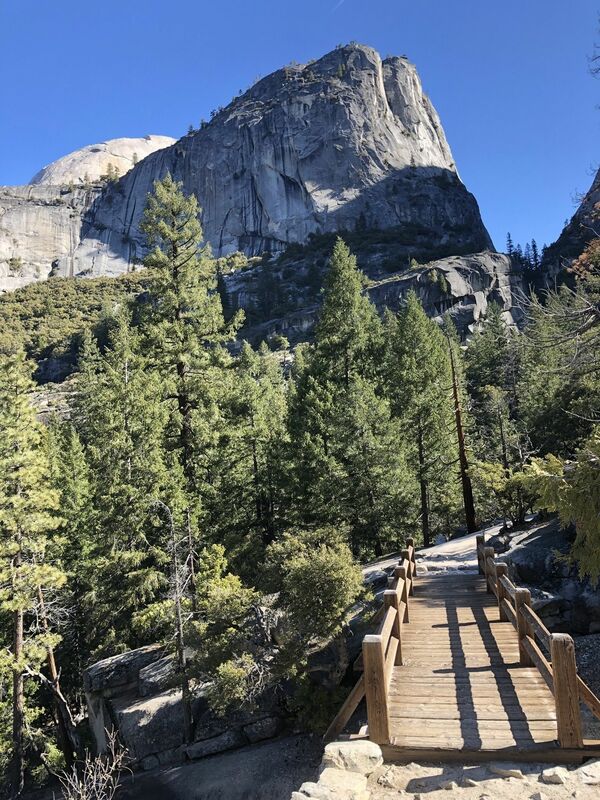 These trails are the 'gateway' to Little Yosemite. 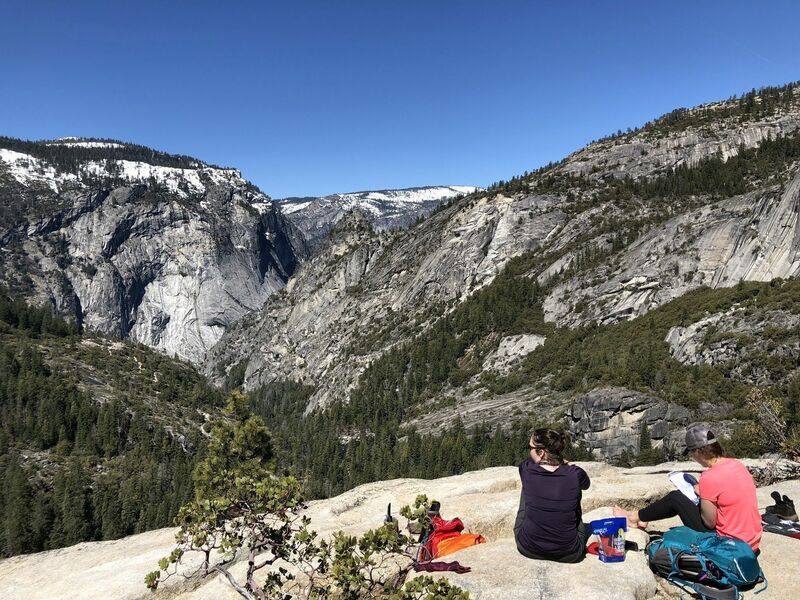 Once in Little Yosemite, you can head up Half Dome or Cloud's Rest. Did this hike in mid December and it was great- some icy patches along the way at the time but navigable in hiking shoes alone. Beautiful view from the top of the falls! 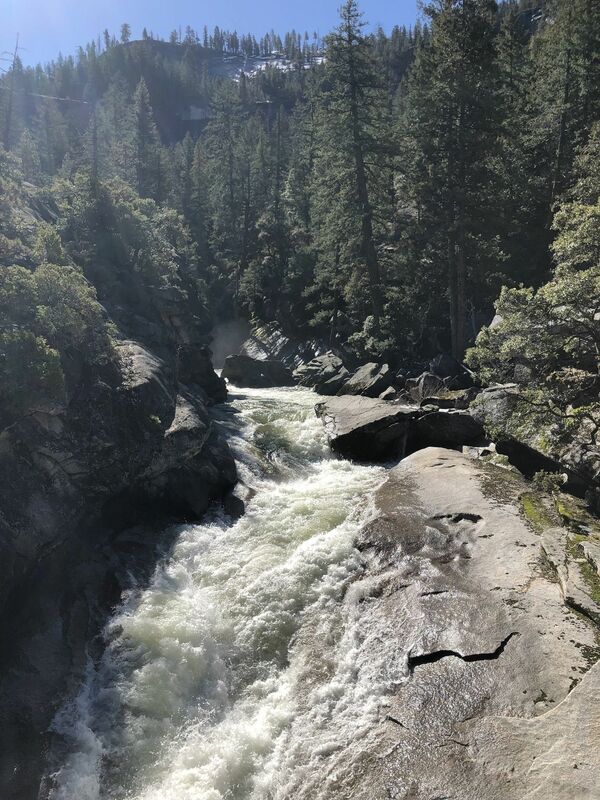 We went up to Nevada falls via the Mist Trail and then looped back down the John Muir switchbacks. 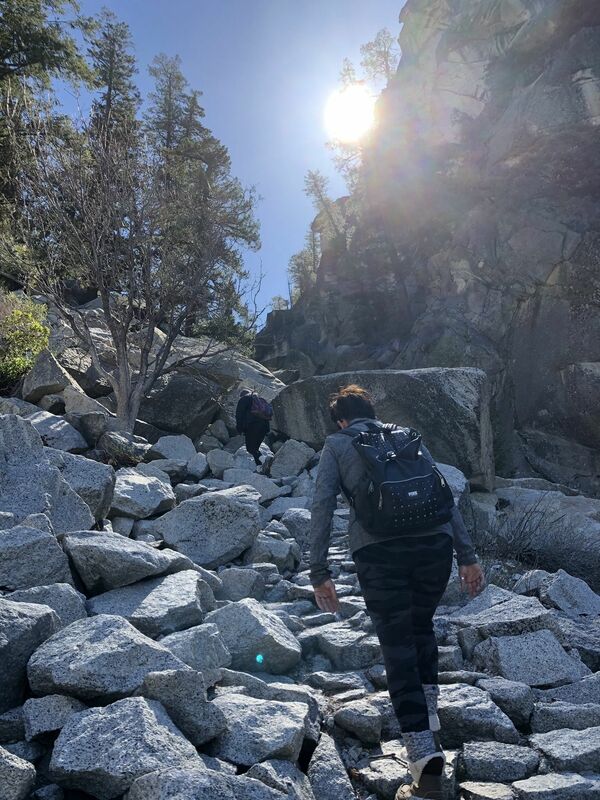 If you like to hike you must do this - it’s beautiful and rewarding. I love this hike. 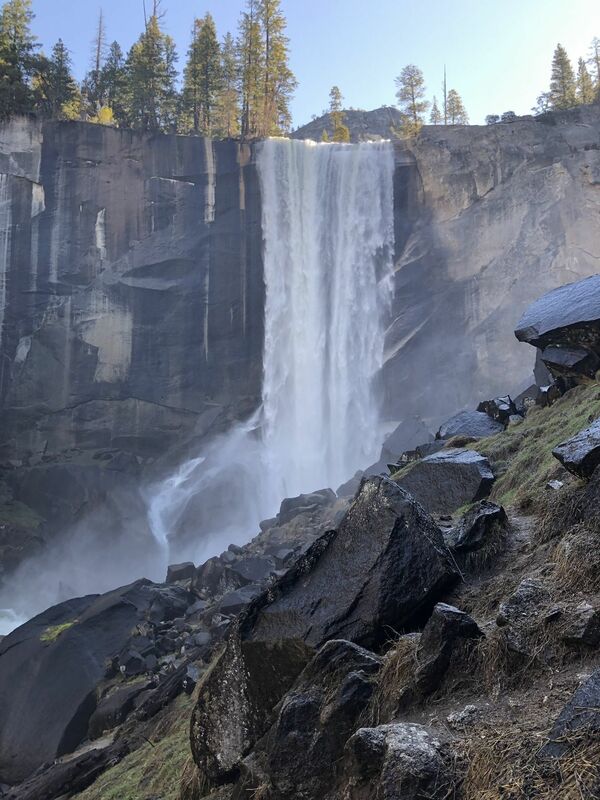 We went when the falls were just thundering and we were soaked so be prepared for that possibility depending on how Vernal falls is running. 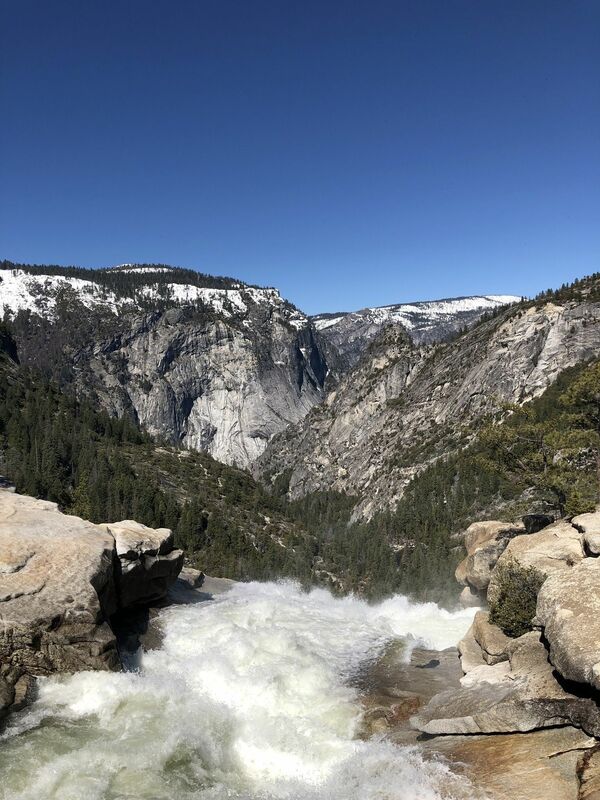 If you’re in Yosemite and have not done this hike just do it you will not regret it! Spectacular views. JM trail was closed so we couldn't do the loop in mid october. Ended up doing out and back on the mist, still a great hike. Definitely one of the more popular trails in the valley, so be prepared for lots of traffic on trail. 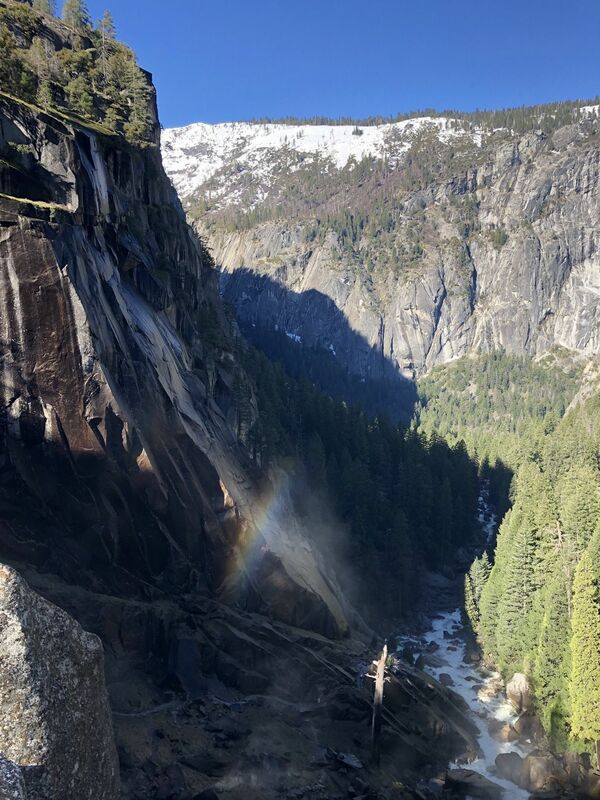 We did this hike in mid-December. 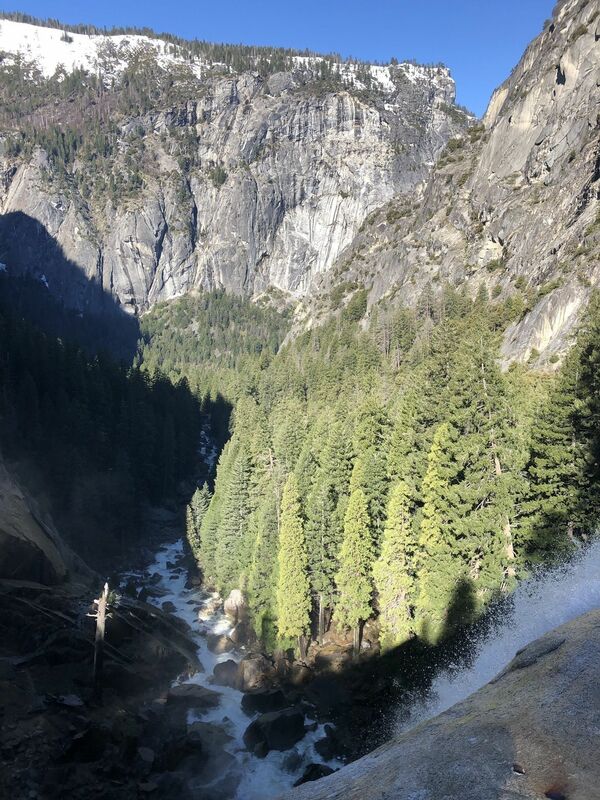 While cold on the valley floor, we quickly warmed up with both the elevation gain and increased exposure to the sun. Really busy at the base of the hike but thins out as different path options are made available. 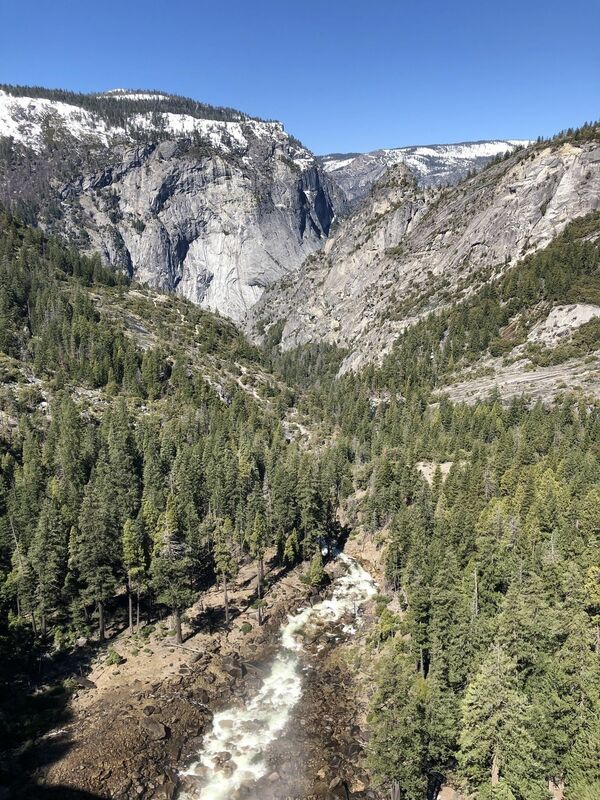 Beautiful views of the valley and two legendary waterfalls. Great places to stop for lunch or enjoy a beer. Easy to follow, although we weren't able to do the full loop due to trail closures from rockfall risk. Challenging hike but the views are worth it. I'd definitely like to check it out in the Spring. Trail got pretty busy on the way down so start early. Awesome trail that is almost completely uphill out and downhill back. 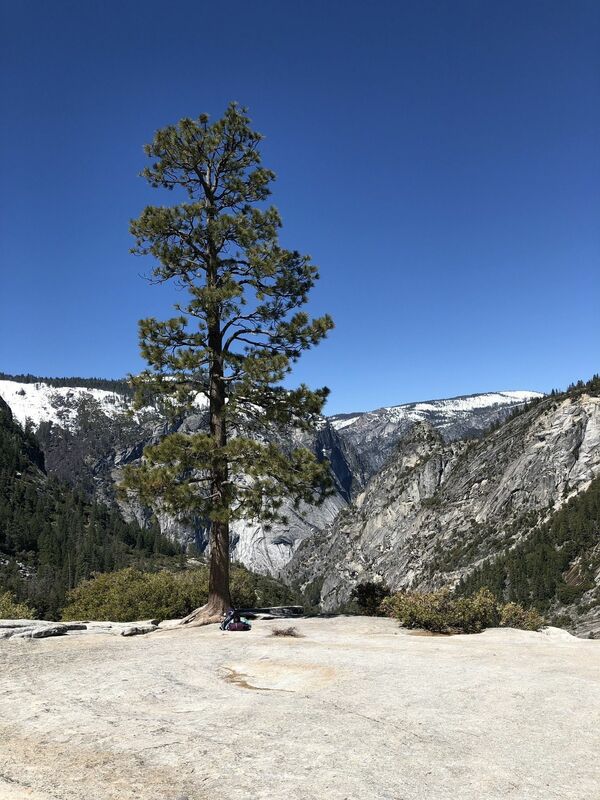 This is a do not miss hike when in Yosemite. The views get better and better as you go. 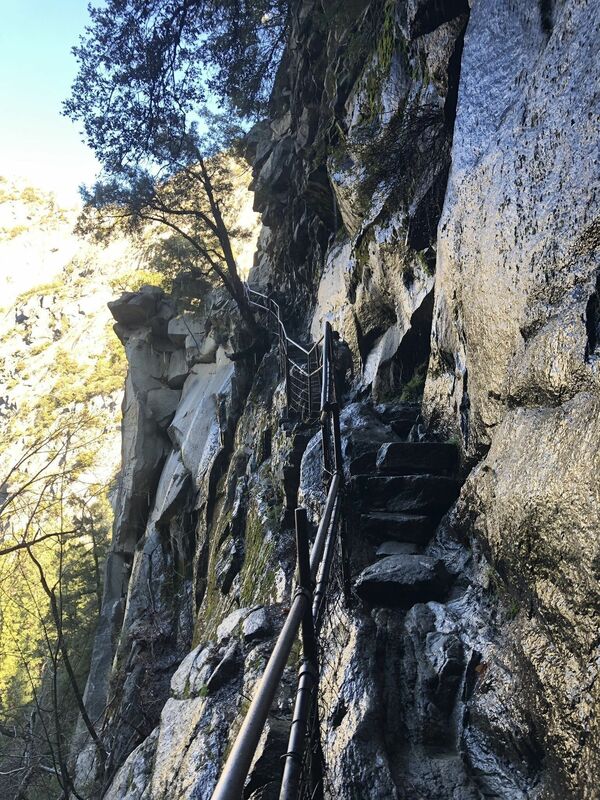 Completed it over New Years so it was a little icy on the stairs by the top of the falls but there is a little side route to avoid the ice if you need.